Ants are the most commonly reported nuisance pest with more than 50% of homeowners reporting problems. Most people report finding ants in homes, garages and vehicles. The good news is there is a natural, environmentally sound way to get rid of ants and prevent more from coming in. Ants are generally considered beneficial insects. 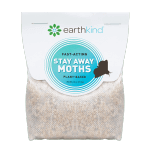 They aerate soil and feed on other insects which can become household pests. There are numerous different species of ants. Carpenter ants can cause property damage because they may build nests in the timber of homes or buildings. Although they are undesirable houseguests, they are essential to healthy ecosystems. Ants can enter through very small openings. Check the area thoroughly to find small cracks or holes ants might use to gain entry. The best way to avoid an ant problem is to seal them out of a house by filling in the cracks in the foundation and caulking cracks around doors, windows, plumbing, electrical conduits, and any other avenue where they gain entry. 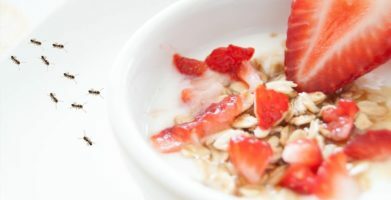 Any type of food or food particles can attract and provide food for ants. Store food, especially pet food, in tight containers. 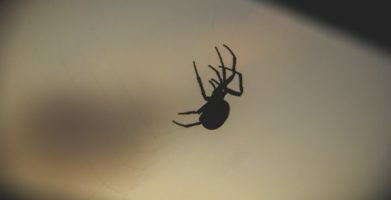 Remove plants that can attract ants such as peonies and control aphids, whiteflies and other insects that produce honeydew. Reduce moisture sources, including condensation and leaks. 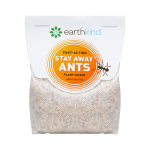 Stay Away® Ants is a great alternative way to get rid of ants. It is safer and longer lasting than chemical killers and keeps ants from entering spaces in the first place. Repelling ants creates less mess than baiting ants and stops the problem before it begins. Stay Away® Ants is a natural ant repellent that has been tested and proven safe and effective. There are no harmful side effects caused by using this product. All Stay Away® products come with a satisfaction guarantee and are 98% biodegradable, so they’re safe for the environment, people and animals. Stay Away® Ants has a pleasant scent – it’s made from lemongrass, peppermint, and thyme essential oils, and plant cellulose fiber from corn cobs. This scent repels ants by obscuring the scent trails they follow as well as the scent of the food they seek. Ants will leave the area to avoid the scent. All you need to do is place Stay Away® Ants pouches around the areas where ants enter your space. It’s easy to use and there is never a mess to clean up. You won’t find an easier way to get rid of ants. 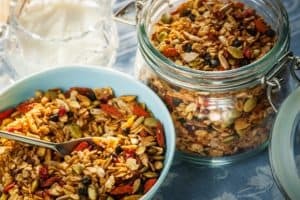 Clean Up – Remember to remove food sources. Keep trees, shrubs and grasses trimmed and cleared away so they are not touching the building; this will make it more difficult for ants to come in. Seal Up – Sealing up or blocking off entry points is crucial to controlling ants. Pouch Up – Place Stay Away® Ants pouches anywhere you see ant activity. The pouches will repel ants for 30 days, or as long as the scent remains noticeable. After the scent dissipates, exchange old pouches with fresh ones for continued protection. Ants are the most commonly reported nuisance pest with more than 50% of homeowners reporting problems. Most people report finding ants in homes, garages and vehicles. Ants are generally considered beneficial insects. 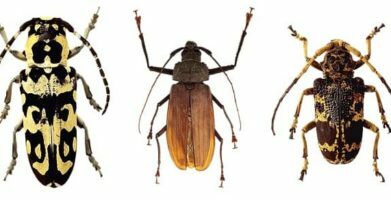 They aerate soil and feed on other insects which can become household pests. There are numerous different species of ants. Carpenter ants can cause property damage because they may build nests in the timber of homes or buildings. Although they are undesirable houseguests, they are essential to healthy ecosystems. Ants can enter through very small openings. Check the area thoroughly to find small cracks or holes ants might use to gain entry. The best way to avoid an ant problem is to seal them out of a house by filling in the cracks in the foundation and caulking cracks around doors, windows, plumbing, electrical conduits, and any other avenue where they gain entry. Any type of food or food particles can attract and provide food for ants. Store food, especially pet food, in tight containers. Remove plants that can attract ants such as peonies and control aphids, whiteflies and other insects that produce honeydew. Reduce moisture sources, including condensation and leaks. 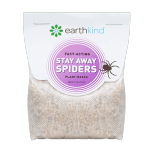 Stay Away® Ants is a great alternative way to get rid of ants. It is safer and longer lasting than chemical killers and keeps ants from entering spaces in the first place. Repelling ants creates less mess than baiting ants and stops the problem before it begins. Stay Away® Ants is a natural ant repellent that has been tested and proven safe and effective. There are no harmful side effects caused by using this product. All Stay Away® products come with a satisfaction guarantee and are 98% biodegradable, so they’re safe for the environment, people and animals. Stay Away® Ants has a pleasant scent – it’s made from lemongrass, peppermint, and thyme essential oils, and plant cellulose fiber from corn cobs. This scent repels ants by obscuring the scent trails they follow as well as the scent of the food they seek. Ants will leave the area to avoid the scent. All you need to do is place Stay Away® Ants pouches around the areas where ants enter your space. It's easy to use and there is never a mess to clean up. You won’t find an easier way to get rid of ants. Clean Up - Remember to remove food sources. Keep trees, shrubs and grasses trimmed and cleared away so they are not touching the building; this will make it more difficult for ants to come in. Seal Up - Sealing up or blocking off entry points is crucial to controlling ants. Pouch Up - Place Stay Away® Ants pouches anywhere you see ant activity. The pouches will repel ants for 30 days, or as long as the scent remains noticeable. After the scent dissipates, exchange old pouches with fresh ones for continued protection. string(22) "How to Get Rid of Ants"